We’d love your help. Let us know what’s wrong with this preview of Bizarre Bible Stories 2! by Dan Cooley. An escape through a toilet, a king in a suitcase, and 23 other things that really happened! 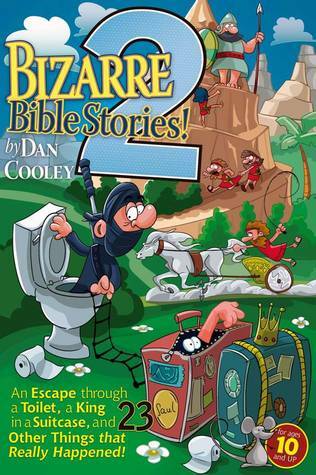 Like Bizarre Bible Stories 1, Dan Cooley hits a home run in this second edition. An escape through a toilet, a King in a suitcase, and 23 other bizarre stories that really happened. This book will help get your kids get hooked on the Bible. To ask other readers questions about Bizarre Bible Stories 2!, please sign up. Be the first to ask a question about Bizarre Bible Stories 2! Bizarre Bible Stories gets two super huge thumbs up from our family! The best books for kids appeal to two audiences—kids and the parents who buy and often read the books to them. Dan Cooley nails it with his Bizarre Bible Stories. The book’s fun, conversational style, amazing facts, and wildly bizarre stories have captured the interest of not only my kids, but us parents as well. And, can you believe it? My teenagers are even enjoying it. Each self-contained story offers scripture, the story told Bizarre Bible Stories gets two super huge thumbs up from our family! One of the things I loved about this book is that it brings to light lesser known stories. If we believe all scripture is inspired and good for teaching, then why do we focus a couple dozen stories? Cooley has chosen some great stories that have even my Sunday School veterans, hanging on to hear what happens next. Bizarre Bible Stories makes an excellent family devotional. Because it’s important to give children the opportunity to make their own Bible study habits, I would also recommend this book as a gift to older elementary or middle school students to work through on their own. Even though I am not the most religious person I really did enjoy this book and could see reading it to my future children. The cover is very colorful and eyecatching. Just as colorful as the writing throughout the book and the stories found within the pages. I found myself having a hard time putting the book down. It was a page turner. I found myself very much enjoying myself throughout this book. I would definitely continue reading from this au Goodreads win. Will read and review once received. Family: I met my wife JoLynn in college and she has given me four wonderful children: Megan (Jon), Amanda (Jake), Micah, and Caleb. Personal Stuff: As a mi Family: I met my wife JoLynn in college and she has given me four wonderful children: Megan (Jon), Amanda (Jake), Micah, and Caleb. Personal Stuff: As a missionary kid, I’ve always known who Jesus was, but it wasn’t until college that I really began to look at how He fit into my life. Discovering the answer has been a mysterious, exhilarating, long (and sometimes difficult) journey, but I could not imagine a life without Christ. While living in Winnipeg MB a friend came up to me after church. She said, "Dan, don't take this wrong, but I think you may be a better writer than a speaker." She then introduced me to her agent, and Bizarre Bible Stories was picked up by Baker Books about a year later. Now, I get to tell stories as a pastor, a dad, and a writer. Writing is harder for me then speaking, as it's difficult for me to think with my mouth closed. Along with a beautiful wife and four terrific kids, I have a Jeep. People with Jeeps are more fun.